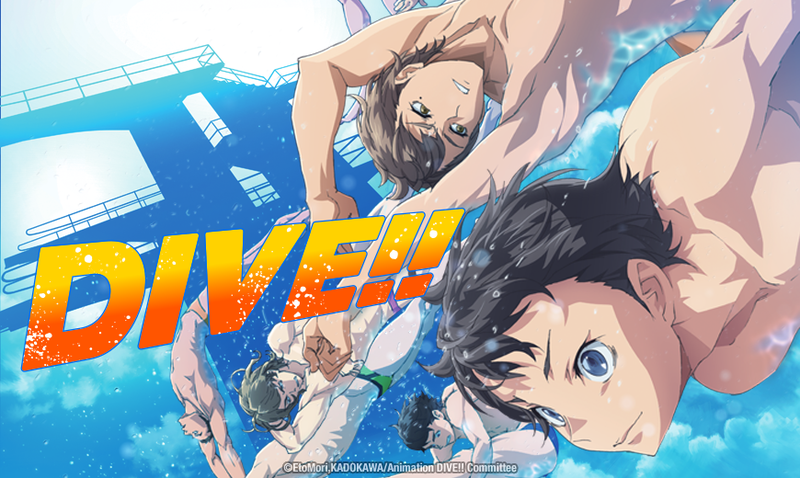 HOUSTON, TX August 28, 2018 – Sentai Filmworks announced today that it has acquired distribution rights to the high school swim team series DIVE!! for the USA, Canada, the UK, Ireland, Wales, Australia, New Zealand, Scandinavia, South Africa, Latin America, Spain and Portugal. DIVE!! will be available for purchase in December 2018. From Zero-G studios (Grand Blue, DOREIKU The Animation), DIVE!! revolves around the Mizuki Diving Club as they struggle to stay afloat due to financial troubles. With their sponsor threatening to pull their funding, Tomoki Sakai and the other members of the club need nothing short of a miracle to keep practicing the sport they love. Luckily, their new coach Kayoko Asaki makes it her mission to not only save the club but to get the team to pass the Olympic qualifications! Produced by Fuji TV (One Piece, Dragon Ball, Hunter x Hunter), Aniplex (Boruto, FULLMETAL ALCHEMIST), DMM pictures (Inuyashiki, Dies Irae) and Dentsu (Fairy Tail, Bleach), discover how passion, determination and teamwork transform the members of the Mizuki Diving Club as they begin the battle to fulfill their dreams.